BOSTON (AP) Avery Bradley had his homecoming, but nobody on the Pistons enjoys a trip to Boston more than Andre Drummond. 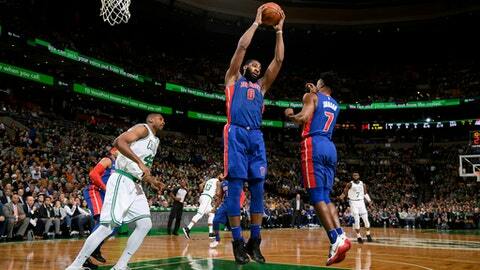 The Detroit center had season highs of 26 points and 22 rebounds on Monday night to lead Detroit to a 118-108 victory and send the Celtics to their first loss on the parquet floor since their home opener. Tobias Harris scored 31 in the matchup of old-school rivals who are once again the top teams in the Eastern Conference. Drummond had 10 rebounds in the first quarter and 11 points in the last 5:36 to help Detroit win for the third time in four games. In 10 games in Boston, he has averaged 16.2 rebounds; it was the third time he had grabbed 22 boards in the building. Reggie Jackson scored 20 points with seven assists for the Pistons, who opened an 11-point lead in the first quarter but needed consecutive three-point plays from Drummond down the stretch to pull away. Bradley, who played the first seven years of his career for the Celtics, received a standing ovation during pregame introductions, then scored 13 points. Marcus Smart scored 23 points, making 6 of 9 from 3-point range, and Kyrie Irving had 18 with nine assists for the Celtics. Boston has lost two of four since a 16-game winning streak. ”They tried to take the ball out of Kyrie’s hands, and they did so pretty successfully,” Celtics coach Brad Stevens said. It was tied 100-all with 5:36 left before the Pistons pulled away thanks to Drummond. With just over three minutes left, he stole a lazy inbound pass at midcourt and drove for the dunk, drawing a foul from Irving. The free throw made it 109-102. It was 114-108 when Smart’s long, leaning 3-point attempt rimmed out with 34 seconds left. ”We had a chance to win, but we had too many mistakes,” Celtics center Al Horford said. The Celtics fell behind 16-6 in the opening minutes, continuing a trend of early deficits. Detroit led 31-23 after the first quarter, but Boston scored the first eight points of the second to tie it. A seven-point Detroit lead in the third quarter was quickly erased, but then the Pistons responded with eight straight points and the Celtics matched that, too. Already wearing a mask because of a broken bone in his face, Irving had to check in with the trainer in the game’s opening minutes after getting hit in the mouth. He did not need to come out of the game. Drummond added six assists and four steals. He’s the first player with that many points, rebounds, assists and steals since Charles Barkley on Jan. 20, 1990, according to NBA.com. … Bradley was traded to open cap space for Gordon Hayward. … Red Sox president of baseball operations Dave Dombrowski sat courtside. … The 118 points allowed was a season high for the Celtics. … Bradley was 2 for 11 after hitting his first three shots. Pistons: Host Phoenix on Wednesday night.